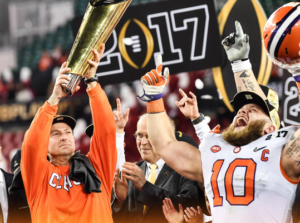 Wireless data use at big sports events keeps continuing to grow, with AT&T reporting that its cellular network traffic from Monday’s College Football Playoff championship game between Clemson and Alabama was double the total from last year’s game. According to AT&T, it saw fans use a total of 3.8 terabytes of wireless data Monday, on its stadium distributed antenna system (DAS) network at Raymond James Stadium as well as from other network sites in and around the stadium in Tampa. At last year’s championship game in Glendale, Ariz., AT&T saw 1.9 TB of data used on its cell networks. Keep in mind, these numbers are for AT&T networks ONLY, so the total wireless numbers are much larger. Unfortunately, Verizon Wireless is (so far) declining to report its wireless data statistics from Monday night’s game, a situation we hope they reconsider; we are also still waiting to hear from Sprint and T-Mobile representatives to get their figures from the event. We also have a call in to the stadium authorities to see if we can get figures from the in-stadium Wi-Fi network, so stay tuned. If AT&T’s numbers are any indication, the thrilling 35-31 Clemson victory might just join our list of top single-day wireless event, especially since the event set an attendance record with 74,512 on hand to witness the drama.